Veronica Roth is the author of the Divergent series. She is one cool author and she's currently working hard on the third and final book of the Divergent Trilogy. On this page you have access to everything you'd like to know about Veronica Roth. Please be sure to check out the link to her bio below for a full page story on her. We'll be sure and search high and low for any new information regarding our favorite author and the progress she's making on the 3rd Divergent book so we can keep you informed. Any guesses as to which of the Divergent Factions Veronica Roth would have joined if she were forced to choose? Here is a list of Veronica Roth books. To purchase the books on Amazon, simply click the link that describes the type of book you'd like and you'll be redirected to Amazon. To read more about Veronica Roth, see the bio information below. 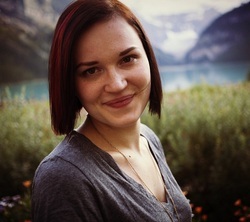 This article contains some basic information and facts about Veronica Roth (Divergent author) such as where she is from, how old she is, how tall she is, her marriage status. I'll also let you know what books Veronica Roth has written and how to send fan mail or follow her on her blog, Facebook, Twitter, Tumblr, etc. I have to tell you that when I first started researching Veronica Roth, Divergent author, I didn't expect much. I thought I would find out some basic information about the author to give me a little bit of background about where the author of Divergent got her ideas from, but I have to say that I am intrigued by this particular author. She seems extremely down to earth, funny and inspiring. You can tell that she loves and values her readers and I admire that quality greatly. Let's take a deeper look into who the author of Divergent is. How Old is Veronica Roth? Veronica Roth is an extremely young writer with great early success. She was born on August 19, 1988 which makes her 24 years old. Where is Veronica Roth From? Veronica Roth was born in a suburb of Chicago, IL. She now lives directly in the city which is the setting and filming location of her book and movie, Divergent. Where Did Veronica Go to College? Veronica studied creative writing at Northwestern University in Illinois. Is She Married? Does She Have Kids? Veronica married photographer Nelson Fitch in 2011. She does not currently have any children. How Tall is the Author of Divergent? Veronica Roth claims to stand six feet tall when wearing her shoes. Based on her Dauntless writing style I'd bet those shoes are sneakers and not high heels! What Books Has Veronica Roth Written? So far the only two actual books Veronica has written have been Divergent and Insurgent. She is currently working on the third book of the trilogy which is yet to be named. Below you will find short summaries of her first two books and a companion story that she wrote about Divergent. Divergent: Divergent is a book about a young teenage girl who is forced to make a decision that will change the course of her life. It is set in the future, in a dystopian society, where people must live in groups that are governed by specific, conflicting values. We follow the young teen as she struggles to find her place among a divided society. Rating: 5/5 stars. Free Four: Free Four is the short retelling of the knife throwing scene in Divergent by the character Four. Insurgent: Insurgent is book two of the Divergent trilogy. In this book we follow the same young teen as she has to mentally cope with the consequences of her choice while trying to save her society from a great evil... itself. Rating 5/5 stars. Detergent: No, the book is not really called "Detergent," it is simply a humorous name that Veronica came up with as she finishes up the Divergent trilogy (see why I like this author so much?). There have been no details released on this book except that it should be available in fall of 2013. Which Books Have Become Movies? Lionsgate Films has picked up the film rights to Divergent as of April 2012 and will begin filming the movie in Chicago, IL beginning March of 2013. I am a huge fan of Veronica Roth's blog because she speaks to the readers in such a personal tone. She keeps her fans up to date with great detail and is thankful for her success (she gave away six signed copies of her Insurgent book to loyal readers recently). She's got such a great writing voice that it's fun to hear the stories about what she is up to- no wonder the Divergent trilogy is such a success! Does Veronica Have a Facebook Page? Is Veronica Roth on Twitter? Does She Have a YouTube Channel? I highly recommend the comical marshmallow bathtub video seen below! What is Veronica Roth's Address? If you would like to send fan mail to Veronica, her mailing address is found below. Leave any comments you have on our social media sites. You never know, she could stop by and see them! Thank you for stopping by to read about Veronica Roth, Divergent author.